It was called an “unconventional” move made by the Vancouver Canucks on September 30, 2008. Manager Mike Gillis and Coach Alain Vigneault conspired to name goaltender Roberto Luongo the new captain of the west coast club. They circumvented the official rules of the NHL, which state: “No playing manager or playing coach or goalkeeper shall be permitted to act as captain or alternate captain”, by technically following that decree. The acrobatic twine tender did not have the letter “C” stitched on his sweater—though he was pictured in publicity shots with that letter prominently adorning his jersey. His own personal solution was to have it painted on his mask. He became the seventh NHL puckster playing that position to be granted that honour. Luongo had been deemed captain material two years before the actual appointment because of his leadership abilities. However, after only one campaign he voluntarily stepped down from the role “to place his entire focus on goal tending”. He stopped short of saying the captaincy was a “distraction”, but admitted “it was something less on my plate”. Willie Mitchell, one of the three alternates, was designated to “argue with referees”. In the 2012 All Star match, another “unconventional” stance was taken. It went without saying, that when the league ruled there be no backstops filling these roles, no “C” or “A” could be worn by any member of the netminder’s union. And, although officialdom may be treated lightly in such an exhibition contest, that particular legislation was also overlooked. Henrik Lundqvist sported a big “A” on his Team Alfredsson sweater. Both of these issues stem from circumstances present during the 1947-48 schedule. That was the first season for captains and alternates to be singled out to display a “C” or an “A” on their chest. 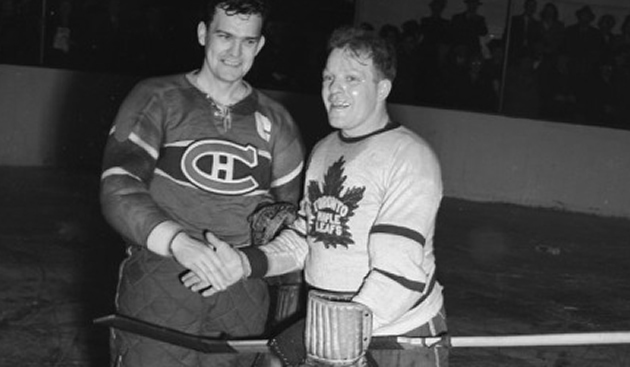 Because of their leadership capabilities both Chuck Rayner of the Rangers and Bill Durnan of the Canadiens had the latter character sewn on their shirts. Interestingly enough, that was the year New York wore an alternate uniform, with “RANGERS” forming a half circle on the chest above a large number, meaning there was no room for either letter there. So the Blueshirts pinned theirs on their left sleeves. With Durnan, “Toe” Blake’s broken leg prompted the Habs’ management to replace his “A” with the “C”, from January through the rest of the campaign. Already boisterous in shouting encouragements and directions to his mates, the big ambidextrous keeper of the cage began to take advantage of his new authority. He constantly verbally accosted officials with his protests, not only making their task more difficult, but repeatedly giving Montreal breathers from the action. So what is called the “Durnan rule” was in place by the time the next season began. While it is common to see a “C” on college goalies’ chests, the six-time Vezina trophy winner is the only NHL cage cop to ever wear that letter over his heart. But neither he nor Luongo was the first to be placed in that leadership position in the world’s premier circuit. It is worthwhile mentioning there were at least two puck stoppers in pre-NHL fraternities, who were appointed to that role. Quebec-born “Peerless Percy” LeSueur was the first. A right-winger for his home-town junior and senior clubs, he moved to Smiths Falls in 1905 where he became an emergency replacement in net. He was outstanding between the uprights, and continued to star as a backstop in the Federal League. It was still the era when the Stanley Cup was a challenge trophy, and the Falls squad put in their bid, taking on the much stronger Ottawa Silver Seven. He was so impressive in that two-game, total-goal series, that the Capital City club signed him to play for them in the second game of the finals against the Wanderers. He remained with Barber Poles for eight years, during three of which he carried the triple portfolio of player, captain, and manager. He was traded to the Toronto Ontarios in 1914, where he played for one season, before the sextet was disbanded. He eased into the city’s Blueshirts’ lineup, where he remained until his wartime service began in 1916. Following his on-ice career, he coached and managed arenas in Windsor, Detroit, Fort Erie and Syracuse. 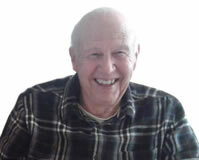 He was also involved in the founding of the Can Pro League in 1926, and later became a sports journalist. He is credited with experimenting with a baseball-type catching mitt for those playing his position, and inventing the gauntlet glove which protected the netminder’s wrists and arms. Although Harry “Happy” Holmes began his pay-for-play tenure in his native Ontario, it was with the PCHA Seattle Metropolitans that he really made his mark. Signing with first American team to capture Lord Stanley’s coveted mug, he moved “west” for the 1915-16 season. For seven campaigns he sported the big “S” on his green and red jersey and his matching baseball cap, championing the effort which took the World Championship to Seattle in 1917. His defining moment as a guardian of the twine came on March 26, 1919. For 60 minutes of regulation time, and 20 minutes of overtime, he and the Hab’s legendary George Vezina waged a memorable battle of flawless backstopping. Referee Mickey Ion mercifully called the match and it went into the books as a scoreless draw. It was following that valiant display that the team’s executives selected “Hap” as captain of the club. He remained in that venue until 1924. It was written of him” “If there had been a trophy for leading goalies during the period in which he played, he would have won it eight times!” No wonder Seattle honoured him in that fashion. John Ross Roach is the only NHL’er to be born in the town of Port Perry, now a bedroom community of the GTA, nestled on the shores of Lake Scugog. After only one year in Junior and another at the Senior, he joined the Toronto St. Pats (later the Maple Leafs) for the 1921-22 season. After a slow start he came on so strongly he was considered to be the catalyst when the Green and White disposed of the Ottawa Senators in the east, then outlasted the Vancouver Canucks 3 games to 2, to lay claim to shinny’s silver chalice. One journalist of the day opined that he was a close second to “King” Clancy as the best first-year player in the business. The Queen City powers-that-be wished to recognize his value to the sextet, and just previous to the 1925-26 campaign Toronto newspapers headlined the announcement that the acrobatic backstop would be the new captain of the Irish. At 5’5”, and weighing only 130 pounds, he was one of the smallest, yet most exciting netminders in the league. He happened to be a teammate of Babe Dye, who was reputed to have the hardest shot in the loop during that era. One day at practice the diminutive Roach bet his contemporary a cigar he could stop any shot he could fire at him. He was successful—sort of. He deflected the last drive with his foot—and it broke his ankle. He had lots of leisure time to smoke his stogie. Roach was small, but they didn’t nickname Roy Worters “Shrimp” for nothing. He stood a mere 5’3” and tipped the scales at 135 pounds soaking wet. But his outstanding goalkeeping prompted his accomplishments to be referred to as “sorcery between the pipes”. He was a member of the USAHA Pittsburgh Yellowjackets who turned professional with the NHL in the fall of 1925. After a single campaign of stellar play he was named team captain, remaining in that role until he was traded to the Americans in 1928. If Manager Odie Cleghorn needed a reason to bestow this mantel on him, it was demonstrated during the club’s inaugural season. When a place in the playoffs was on the line, he admonished his mates to “get one goal and Detroit won’t beat us!” And, even though the puck was in the Pirate’s end for virtually all of the third frame, the little whiz staved off every attempt to get the disc by him. Never one to let pain slow him down, his habit of deflecting shots with his stick hand earned him more than his share of broken bones. On one occasion he played several contests sporting a cast, his stick taped to his big glove. Previous to the 1932-33 season the NHL introduced a strange rule, which stated that “captains had to be on the ice at all times” (even though there was an option of informing officials an alternate was taking his place). The simplest route was followed by three of the circuit’s teams—Canadiens, Ottawa, and Chicago—appointing twine tenders to be captains. George Hainsworth was the happy choice of the Habitants. His cool and unflappable demeanor was perfect to stabilize the “Flying Frenchmen”. A late starter, who starred with the Senior Kitchener Greenshirts for six years, at age 30 he commenced his career as a shinny mercenary with the Saskatoon Crescents of the WCHL. It was remarked that he weighed only 135 pounds at the time, and that his pads seemed almost as tall as he. But as an NHL rookie he quickly displayed outstanding prowess by becoming a shutout icon, climaxing his superior efforts with 22 whitewashes in just 44 games in 1928-29—a record impossible to match or beat. His goals-against-average was a stingy 0.92; and his eight-year overall average was 1.78. That was one of the three years running that he “owned” the Vezina Trophy, donated in honour of the man he replaced. He was a shoo-in for the Hall of Fame. Ottawa designated Alec Connell as their captain that same fall, a position he held for but one season, because he temporarily retired following the completion of that schedule. He became a netminder by accident. While stationed in Kingston during WWI, he was asked to help a team who had no one to play net. Although his debut saw him play without the advantage of skates, he caught on quickly. After seasoning at the Junior and Senior level, he turned pro with the Senators in 1924-25. During his tenure in Canada’s Capital, he set a record for six consecutive shutouts, totaling 443 minutes without allowing a goal. By the time he had hung up his blades he had amassed an amazing 81 shutouts in 471 contests. Always a prankster, he once gave an interview during which time he claimed that the Montreal Maroons would welcome a hotshot rookie named McGoogan to camp that fall. He was reported to be able to play all positions from goal out. Newspapers heralded his arrival—but he never showed up. A figment of Alec’s mischievous imagination, he never would. Chuck Gardiner is one of two captain cage cops to lead his troops to a Stanley Cup championship. During his seven-year stint with the Blackhawks, the Windy City sextet spent most of those seasons as bottom feeders in the pre-“Original Six” era. Despite that handicap, the “Wee Scot” managed to blank the opposition 42 times in only 315 games. Always a fierce competitor, one of the most remembered tales about his courage under fire took place in Toronto against the Maple Leafs. He was being bombarded with shots from every angle, and, despite his valiant efforts the fired-up Blue and White potted one marker after another. One of those drives hit Charlie in the forehead, causing blood to flow freely. He was replaced by Wild Cude, but he fared no better. He also needed to be helped off the ice after being smacked in the face. So the brave warrior returned to play, his head all bandaged like a turban. In the final period a mischievous fan skimmed his derby hat across the ice in the goalie’s direction. Charlie snatched it up and put in on his noggin, playing the rest of the game decked out in fine fashion. But that championship match ended in a far more serious atmosphere. Like Worters he promised if they would get a single tally, he would take care of the rest. He made good his claim, and the victory was theirs. But he had little time to enjoy the triumph. He had played as a very sick man, and was taken to the hospital right from the dressing room. Brain surgery was performed, but he never recovered. Two months later he was dead. In 1960 John Sturges’ epic western movie, “The Magnificent Seven” was released, and remains a favourite until this day. But the NHL has its own version—seven shinny icons, long remembered for their accomplishments as cage cops—who also were honoured by acting as captains of their hockey clubs.